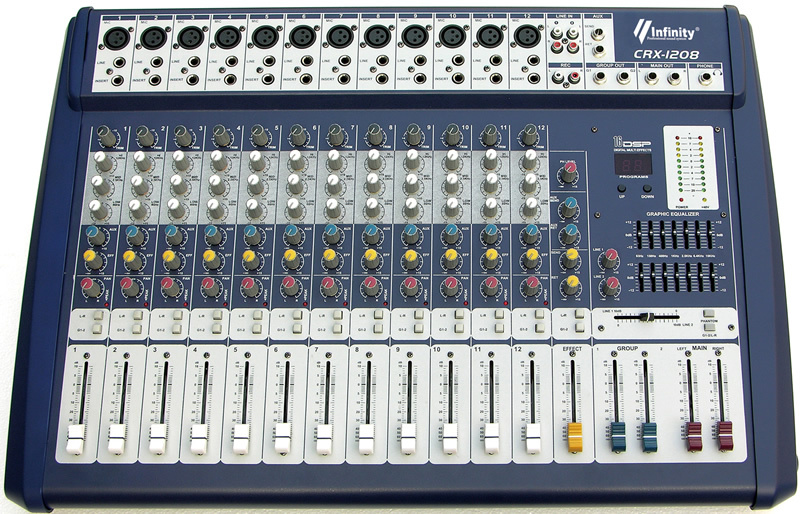 ● Ultra low noise 6/8/12/16 Channel Mic/Line, 16DSP digital effect stereo Powered Mixer. ● 6/8/12/16 Mono input channels with silver plated XLRs, and balanced line inputs and +48v phantom power. ● Peak LEDs on all Mono Channels. ● Ultra-musical 3-band EQ on all channels and 2X7 band EQ on all main outpu. ● 2 Aux Send per channel for external effects and monitoring. ● Highly accurate 10 segment Bargraph Meters. ● 16 DSP Digital delay of the effect system inside. ● Function with channel changes inside (crossfader). ● 2-Track input assignable to master mix, stereo headphone output. ● 1 Main (line) output and 1 Group output.